An expert on an array of social justice issues, Darren Walker is president of the Ford Foundation, the nation's second largest philanthropy. Sustainability. Quality education. Poverty reduction. Gender equality. If this list sounds familiar to individuals working in philanthropy or non-profits in the U.S, it should. Our sector is synonymous with these issues in part because our nation suffers from many of them, despite being the wealthiest country on the planet. But this list is not uniquely American: it is global and universal. Each of these areas is among the U.N.'s 2030 Sustainable Development Goals (SDGs), a global framework tackling 17 areas of economic, social, and environmental development. The SDGs were ratified by 193 governments and apply to every country, both in their domestic policymaking as well as their international aid. For the first time, we have an opportunity to see the most acute challenges facing America as global development challenges. The SDG Index released on July 20th found that the US ranks 25th globally in achieving the SDGs -- far behind world leaders. Across a surprisingly large number of areas -- from maternal health to inequality -- the U.S. fares poorly, and in some cases even worse than developing countries in achieving these goals. The struggle for clean water in Michigan mirrors that in Mali; hunger impacts residents in Illinois just as it does in India. As Americans, especially Americans who care about these issues, we must recognize that the U.S. is in desperate need of development. Philanthropy, for its part, must realize that the SDGs -- as the most ambitious, relevant, and powerful development framework to ever exist -- represent a roadmap for domestic programs here in America. We also must have the humility to admit that we can find answers to our problems by looking to what has worked in other countries around the world. 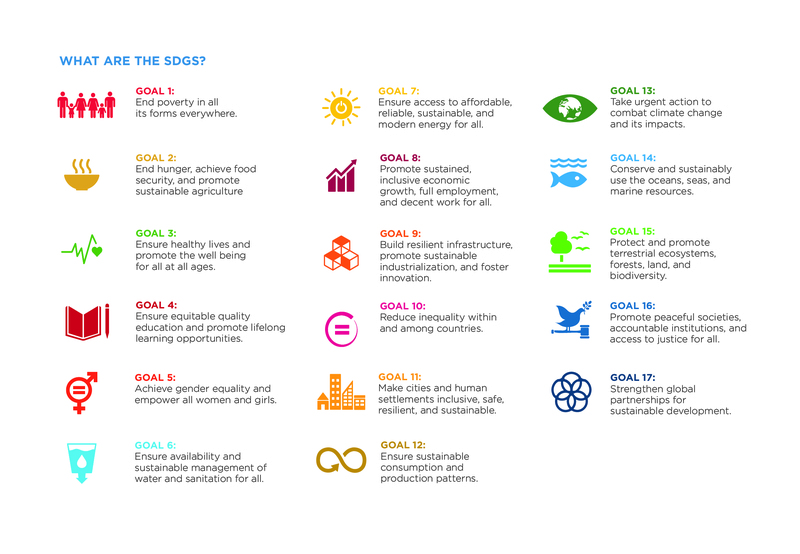 As the Council of Foundations highlights in our new report this week, From Global Goals to Local Impact, the good news is that many U.S. funders and nonprofits are already beginning to use the SDGs in the communities where they work. Foundations in California are using the Human Development Index and other indices to see how their state is faring on SDGs like gender equality and develop appropriate intervention strategies. DATA2GO, New York City's groundbreaking online mapping tool created by nonprofit Measure of America, is allowing community groups to determine what demographics and geographies are most in need of support. In Arkansas, funders are looking to use the SDGs as a tool for cross-sector collaboration, partnering with local government and businesses to improve health and education. The list goes on. Collaborate and partner: make cooperation a priority and look for opportunities to work alongside other foundations, as well as the private sector, governments, and NGOs. Use data and technology: follow the data, including mapping the SDGs and their accompanying targets and indicators to local reports, indices, and studies. Educate and raise awareness: take a leading role in educating grantees, staff, peers in different sectors, and the general public about the SDGs and their transformational potential. Track progress and measure impact: identify ways to measure success and promote evidence-based solutions, especially through data. Trust and listen to the grassroots: engage local leaders and community members to develop effective approaches to make deep, lasting impact. Galvanize and catalyze: think about the long-term, seed pilot projects, and complement government funding. Go deep, with determination: look to change root systems and structures, and realize that sustainable development isn't truly achieved if one person is left out or left behind. The work of philanthropy is critical to the success of the SDGs. For one, the sheer scale and scope of the Goals -- the achievement of which is estimated at $3 trillion annually -- means that the philanthropic community cannot afford to sit on the sidelines. It also means we cannot do it alone. Meaningful progress requires that all sectors work together. Philanthropy is also essential because of what we can bring to these goals -- collaboration, engagement with grassroots leaders, a willingness to take risks and leverage resources -- which are critical components of global development. Funders should bring this experience and expertise to bear as they work to align their domestic grant making within a global development framework. As President Obama said when committing the United States to enacting the SDGs: "We all need to step up with the will and the resources and the coordination to achieve the goals. This must be the work of the world." It is and must continue to be the work of U.S. philanthropy, too.